The Philippines has 3.56 million hectares (ha) of coconut lands where traditional production practices handed down from generation to generation for almost a century remain dominant. These practices include a typical coconut farmer raising unselected seednuts above the ground for eight to ten months. Then when the seedlings reach two feet in height, they are uprooted and planted in the farm at a distance of 10 x 10 meters (m) for a population density of 100 plants/ha per year. In both the nursery and the field, the coconut plants are grown with practically no fertilization and inadequate weeding. 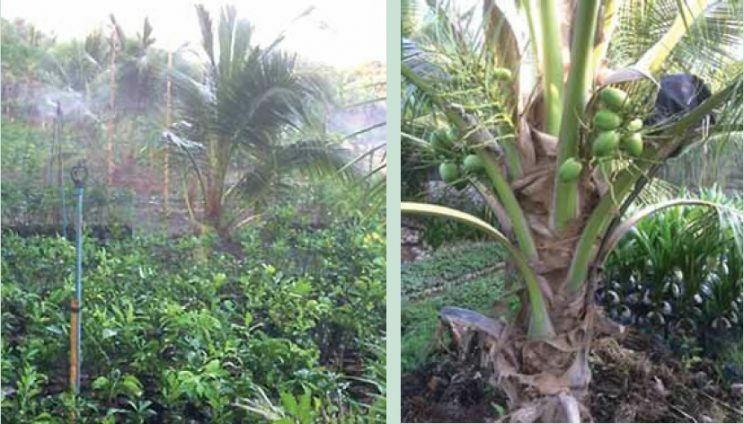 The coconut trees flower and fruit in 7 to 8 years after field planting for the tall type and 4 to 5 years for the dwarf type, both with very low yields. Currently the national average yield of coconut is 43 nuts/tree per year generating a ton of copra or less than 500 kilograms (kg) of vegetable oil/ha per year. In recent decades, hundreds of talented and highly motivated scientists successfully developed a component production technology which brought about a spectacular increase in the yield of oil palm from less than a ton to more than five tons of vegetable oil/ha per year; that’s 10 times the original yield of coconut. Then, scientists in one of the major oil palm plantations, the 60,000 ha United Plantation Berhad (UPB) in the province of Perak, Malaysia, modified the oil palm technology and applied the same to the Philippine coconut hybrid“Matag” (Fig 1). Matag yielded 36,000 nuts/ha per year; this is equivalent to a vegetable oil yield of over 4.0 tons/ha per year. Another coconut hybrid, “Mawa,” which is commercialized in Indonesia, also produced high yields in UPB, similar to that of Matag (Fig 2). UPB commercialized the modified technology in over 5,000 ha of coconut plantation. Fig. 1. The senior author (right) and his friend, Erwin Garcia (third from left) with his wife and sister documented the scientific farming practices used in the 60,000 ha UPB oil palm plantation. 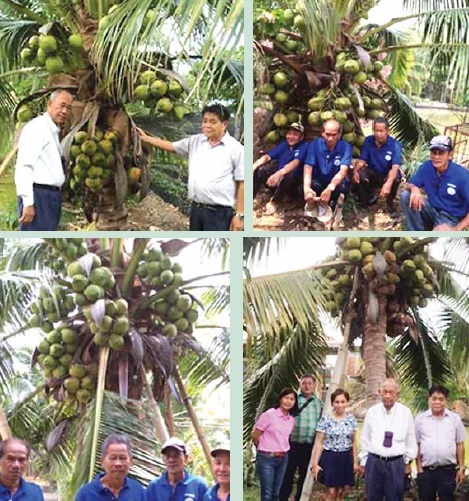 They ended up sharing ideas with the plantation’s key personnel on the potential of coconut – the Philippine Matag and the Thai Nam Hom – while enjoying the healthful and refreshing sweet and aromatic Nam Hom juice. Fig. 2. The senior author between two fruit bunches of highly productive coconut hybrids at UPB: Mawa of Malaysia (left) and Matag (right). Annually, it also produces thousands of Matag and “Nam Hom” ready-to-plant seedlings; these aresold to the Malaysian government for its project to distribute to the poor Malaysian farmers for free,together with the knowledge and capacity to produce high yields. When the senior author, who is engaged in farming, returned to Cotabato from UPB years back, he immediately conducted verification research at Triple P Farms and Nursery (TPFN) on the applicability of what he termed the “Modified oil palm production technology” (MOPPT) to Matag and two special coconut varieties from Thailand, “Nam Wan” and Nam Hom. MOPPT, as used in this paper, is the authors’term for what they assumed are the component practices in the UPB coconut plantation; the assumptions were necessary as they were denied access to the details of the technology being used by the company. In oil palm farming, good nursery and farm management practices are key to promoting early maturity and high productivity. MOPPT is a modification of what is used in oil palm farming for coconut farming, particularly, a lower rate of fertilization and irrigation in MOPPT than in oil palm farming. The discussion below summarizes the procedure and results of the field verification research. The seednuts were germinated in elevated seedbeds. Each nut was partially covered with decayed rice hulls and irrigated as needed. The seednuts germinated two weeks ahead of those raised using traditional practices. Upon germination, the seedlings were transferred to 16”x16” plastic bags containing a mixture composed of 50% garden soil and 50% decaying rice hulls. The plants were adequately irrigated using a sprinkler system, maintained weed-free, and fertilized monthly at the rate of 10, 20, 30, 40, 50, 60, and 80 grams/month of 16-20-0 alternated with 16-16-16 during the first seven months. At eight months the seedlings grown under MOPPT were almost 6.0 ft. tall, more than four times the size of seedlings grown in the traditional way as shown in Fig. 3. In oil palm, it’s a standard practice that seedlings of 4 to 6 ft. tall grown in plastic bags are used for field planting. 1. Field planting: The MOPPT nursery-grown seedlingsin plastic bags were planted in the field, which was well prepared by cultivation. The plants were planted at a distance of 7 x 7 m for a population density of 200 plants/ha. One common feature of Matag, Nam Wan, and Nam Hom is the plants’ short and sturdy leaves, which allow for planting at high density. In Thailand, Nam Hom and Nam Wan are planted at a distance of 6 x 6 m. Planting holes were prepared with sizes slightly bigger than the 16” x 16” plastic bags supporting the plants in the nursery. Basal fertilizer was applied at the rate of 120 grams (g) of 14-14-14/16-16-16 at the base of each hole prior to planting together with five kg/hole of decayed chicken dung. 2. Field management: Each plant was ring weeded regularly to weed-free condition at a diameter of two meters during the first year then increased to three meters during the second year and four meters during the third year and onward. This prevented the weeds from competing with the plants for fertilizer and kept the leaves of the coconut fully exposed to sunlight. No cutting of any green leaves was allowed to maximize photosynthesis. Fertilization of the coconut trees was done quarterly at the rate of 250 g/ tree per quarter during the first year, and 500 g/tree per quarter during the second year. The plants grew fast and flowered at the end of the second year of field planting, as shown in Fig 4. Immature plants in the field were adequately weeded, fertilized quarterly, and irrigated when needed. This resulted in fast growth and flowering in 24 months after field planting. At three years old and onward, fertilization was increased to one kg/tree per quarter. This fertilization rate of 4 kg/tree per year is equivalent to 16 bags of fertilizer (14-14-14)/ha per year. This is lower than the fertilizer rate being used for a year of two crop cycles or a yearof hybrid lowland rice or corn to produce six to eight tons of grains of palay or corn, which is 12 bags/cropping or 24 bags for two croppings a year. It is also lower than the fertilization rate of oil palm which is 8 to 12 kg/tree per year at maturity for a yield target of 25 tons of fresh fruit bunches or 5.0 tons of vegetable oil/ha per year. As noted, the plants produced, on the average, 80 to 120, 120 to 150, and 180 to over 200 nuts/tree per year during the third, fourth, and fifth year and onward, respectively (Fig 5). This is equivalent to an average of 20,000, 27,000 and 38,000 nuts/ha per year during the third, fourth, and fifth year and onward, respectively. The yield of 38,000 nuts/ha per year of Matag is equivalent to 8.0 tons of copra or 4.0 tons of coconut oil. Adequately fertilized and weeded Matag, Nam Wan, and Nam Hom trees at TPFN bear 80 to 120 nuts during their third year, 120 to 150 nuts during the fourth year, and 190 and more more nuts during the fifth year onward. Lower right photo shows the senior author with PCA officials headed by Dr. Ramon Rivera, deputy administrator, and Dr. Pons Batugal, a member of PCA Board of Directors. At a copra yield of eight tons and at a price of Php32/kg, a ha of Matag provides a gross income of Php256,000/ha per year. The major expense is adequate weeding and fertilization of 16 bags of 14-14-14 valued at Php18,400, considering the current price of Php1150/50 kg bag of fertilizer. As observed, the Nam Wan trees gave a better yield than the Matag and Nam Hom trees in terms of the number of nuts/tree. The nut yield of both Matag and Nam Hom at five years old and above are similar, averaging 190 nuts/tree per year. Nam Wan yields exceed 220 nuts/tree per year. Nam Wan, however, can’t be used for copra production—but it gives refreshing, sweet juice and tasty young nuts. Nam Hom can be grown for copra but is better grown for what gives it more value: its refreshing and healthy,sweet, aromatic juice and young nuts. The income from the commercialization of both Nam Wan and Nam Hom is higher than with Matag for copra. In conclusion, the use of MOPPT increased the yield of Matag to the levels obtained in UPB Malaysia and in reducing the immaturity period of coconut from four to two years. The strength of Matag, Nam Wan, and Nam Hom is their responsiveness to fertilization for early maturity and high yields. The authors would like to caution that the results of the research they carried out may not apply to coconut grown in places with dry periods lasting three or more months. Their experience has taught them that to sustain the high yields of hybrid coconut, adequate weeding, fertilization, and high levels of annual rainfall of 1,700 millimeters (mm) and above evenly distributed throughout the year are required. In places with pronounced dry periods, irrigation during dry months can result in the same high yields. As observed in many parts of Thailand, coconut irrigated using a sprinkler or drift system requires less than one-fourth of the water needed by lowland rice, but results in four times more income. The same irrigation system is being used at TPFN. 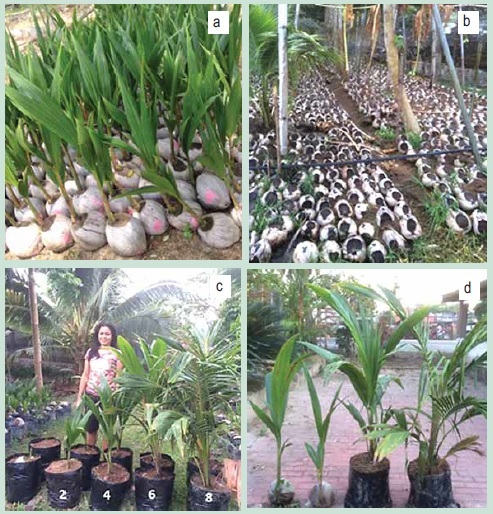 The authors also noted in their research that trees of traditional coconut varieties 20 years and older were less responsive to fertilization for high yields compared to 20 year old Matag trees, which become highly productive after two years of fertilization. The field research of the authors using hundreds of coconut trees is now being expanded to thousands of trees in the provinces of Cotabato and Agusan del Sur. These include an expanding family farm of 10 ha of Nam Wan and Nam Hom for seednut to seedling production by 2020. Another 12 ha farm is being planted to Matag and other hybrids to showcase the commercial profitability of these hybrids using MOPPT in the production of copra, coconut sugar, and virgin coconut oil. Following UPB Malaysia, TPFN is currently establishing a 15 ha coconut hybridization farm to make available by 2021 Matag and Mawa ready-to-plant seedlings. The parent Malayan red dwarf (MRD) and Tagnanan tall seedlings for Matag hybrid production are now at planting heights in the TPFN nursery. These will be planted in Agusan del Sur after the El Niño weather phenomenon at a density of 7 x 7 m for a population density of 200 plants/ha. The production system in terms of land preparation, weeding, irrigation, drainage, and fertilization will be carried out using MOPPT. Hybridization will be carried out with the help of PCA (Philippine Coconut Authority) breeders (Fig. 6). The mother MRD plants are expected to flower in 24 to 26 months after field planting. Hybrid seednuts will be grown to make these available as five-foot tall ready-to-plant seedlings for sale in five years. The senior author (on the right in the left photo above) with Gerardo Baylon, an outstanding PCA coconut breeder, demonstrating the technique of pollinating Nam Hom at TPFN with makapuno pollen to produce hybrid seednuts of aromatic sweet makapuno – a major delicacy in Thailand. PCA breeders shall assist TPFN in Matag and Mawa seednut production. The PCA experience reveals that each MRD mother plant produces 120 hybrid seednuts/tree per year, or a seednut to seedling production ratio of 360,000/year for the 15-ha hybrid seed farm. This is projected to supply enough hybrid seedlings to plant or replant 1,500 ha/year starting in 2021. Research will be pursued to increase seednut production by 50% or 180 hybrid seednuts/mother MRD per year, similar to what is obtained in Malaysia. What TPFN is doing today seems to be a paradox: advocating and doing, by example, the commercialization of a Philippine-developed hybrid, Matag, which was once rejected in the country but which became popular in Malaysia. During the first year of the administration of President Aquino, his officials directed the PCA to suspend hybrid seednut production, claiming it was a “waste of resources considering that…coconut farmers don’t use fertilizer.” This decision negatively affected Matag. A new set of PCA officials, appointed in 2014, restored hybrid seednut production, albeit in limited quantities. The next elected President of the country should be advised to provide the resources and environment conducive to the massive production of coconut hybrid seedlings like Matag in PCA breeding stations and private farms. Then the government should make planting materials of these hybrids available to poor coconut farmers, who should also be capacitated to use fertilizer for high yields. At present, the Philippines needs to plant coconut in new areas and to replant 60 million tall and senile coconut trees in 600,000 ha. Replanting using MOPPT means a farm will be unproductive only for less than three years, assuming no intercropping is carried out. This makes coconut farming highly bankable. From 2007 to 2015, TPFN raised a substantial quantity of imported pre-germinated hybrid seeds of oil palm seedlings to plantable sizes. These were purchased by farmers, bank financed cooperatives, and government projects in Mindanao. Bringing its knowledge and experience from oil palm to the coconut nursery, TPFN envisions to do the same for Matag and Mawa beginning in 2021 with only one difference: theseednuts will not be imported but will be produced at TPFN farms. TPFN believes that placing superior plants in the hands of the poor farmers and empowering these farmers to grow for high yield and productivity will go a long way in transforming countryside poverty to prosperity.